Located within one mile of the Gold Coast and its beautiful beaches, Hyatt Place Delray Beach is a convenient stay for business travelers and the perfect location for leisure travelers and their families. Just steps away from Atlantic Avenue shopping is the Pineapple Grove Arts District of downtown, which is located just north of Atlantic Avenue and is noted for its galleries, performance art and cultural organizations. Delray Beach has been rated Most Fun Small Town by Rand McNally, USA Today and the Travel Channel. Event planning has never been easier with the hotel’s 1,850 sq. 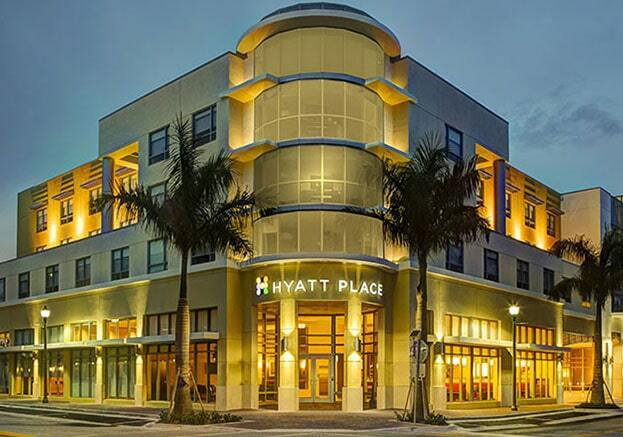 ft. event space which can accommodate board meetings to weddings—downtown Delray Beach is becoming one of the most desirable wedding locations in the south east United States and Hyatt Place Delray Beach is located in the center of it all. Hotel guests can walk to over 100 restaurants, bistros and cafes with plenty of spas and salons for pampering. This new, stylish 134 guest room hotel is also a Silver LEEDS certified building.